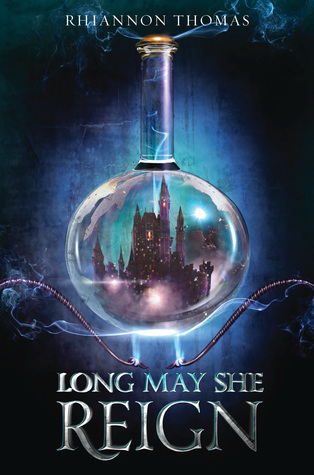 The Review: As soon as I heard about Long May She Reign by Rhiannon Thomas it immediately captured my attention because it’s not often you come across YA fantasy books that are stand-alone and in my opinion there really should be more. The story is about Feyra who is twenty third in line for throne but one night at a banquet someone poisons the guests leaving Feyra their next Queen. As Feyra tries to understand what really happens that night as well as trying to rule her new Kingdom – one she’s never had interest in – she must decide if she’s willing to sacrifice her freedom for her kingdom. Long May She Reign was an interesting YA fantasy book. If I’m honest it’s more like a mystery/fantasy book as the story was more centred on Feyra’s journey to discover the killer and their motive for doing so. And with Feyra never having of planned to become Queen she also needs to learn everything about becoming one and how to rule and learn fast. Her interests are with experiments and being in her laboratory but now she has people to look after and a killer to stop. Feyra was very likable and it was easy to relate to her. She’s also thrown into this world of politics and it was an interesting journey. One that in my opinion was a lot longer than it needed to be. I think this story would have been more enjoyable if it weren’t so long as I did start to lose interest in the middle and it didn’t pick up until the end. I do wish the story had a much strong romance to it. It’s there but it’s such a slow burning one that I started to lose interest in it. When it did happen it was enjoyable enough. In all, Long May She Reign was an interesting read – one that was enjoyable but not amazing. I think it definitely could done with some improvements to have helped make this story. A few weeks ago I told you about Bookworm Candles & Crafts, a UK based company who create bookish themed merchandise such as candles, wax melts, jewellery and even some cosmetic products such as soap and bath bombs. If you missed the first post - CLICK HERE for more information. I will be working along side Danielle, the creator of the company and for the next few months, we will be showcasing some of her exclusive products. Each month will feature a different item and by doing this we hope to make you more aware of some of the amazing bookish products you can purchase. Rifthold is inspired by the captain city of Adarlan and where we first meet Adarlan's infamous assassins. This candle smells of honeyed apples, emerald roofs and of course glass towers. In beautiful shades of emerald and mint green and with all of the signature touches that Bookworm Candles & Crafts add to all of their candles. The charm is of course a castle and no Rifthold castle would be without a gorgeous glass bead to match. The band has been crocheted in emerald wool and the button has an amazing emerald heart. This candle weighs approximately 250 grams and will burn for 30 hours! With the Rifthold being an exclusive candle, it is priced at just £9.00 and only available for the month of November. So be quick, there's not much time left before this candle will be gone! Donna's thoughts: Rifthold is without a doubt a must have product for any Throne of Glass fan! If you've read the books you know how much Rifthold plays a huge part in the series and honestly, the books just wouldn't be the same without it. This candle reflects everything there is about Rifthold, from the scents being uses, to the colour, the charms - everything down to the little details to the glitter on top of the candle. When I smell this candle, it makes me think of Rifthold and Celeana's journey but, more importantly it makes me want to fall in love with Throne of Glass all over again but this time I'll have Rifthold burning beside me! For those of you who know Manon, or even if you don't, Manon Blackbeak is half Ironteeth witch, half Crochan. She is the heir to the Blackbeak Witch Clan and Wing Leader to the Thirteen. She is also the rider to the Wyvern Abraxos and owns a sword named Wind-Cleaver. Manon's scents are spiders silk, burnished gold and hope which gives you a soft and floral smell representing her Crochan heritage. In beautiful shades of yellow and gold with all of the signature touches that Bookworm Candles & Crafts add to all of their candles. Manon comes in a exclusive red tin and the charm is of course wings which represent her leadership of the Thirteen. The band has been crocheted in grey flecked wool and has a leather cord braided into it. This candle weighs approximately 250 grams and will burn for 30 hours! Donna's thoughts: When I asked Danielle why she created a Manon candle her answer was simple. She said "Manon believes that she was born heartless and I don't think that's the case. I think Manon has a huge heart. She's loyal and brutally honest. Her love for Abraxos is second to none and I love that. I wish I was one of the 13. And by creating this candle I wanted to show you her softer and more loving side - her Crochan side." Without trying to spoil the books for anyone who hasn't read it, I honestly 100% agree with Danielle and seeing this candle in person and seeing how beautifully it has been created, you can see much love Danielle herself has put it to this candle to you show you - the fans - who we believe Manon really is. Her scents compliment each other and it has a unusual scent but ones that's soft and floral. If I'm honest, it makes me love Manon that much more - seeing her softer side in person. And finally, we wanted to tell you about Bookworm Candles & Crafts monthly bookish box. November's was the very first bookish box which was sent out to all customers and was a massive success. November's theme was "I Claim You to Whatever End' (Throne of Glass themed). *And finally Chaol's Amethyst Ring: He gave this ring to Celaena in Throne of Glass which she wore until Heir of Fire. Donna's Thoughts: This was the first ever bookish box that I purchased and it didn't disappoint at all. I was really impressed with the selection of items in the box because it wasn't just a candle - there is a huge variety of products and ALL of these items are exclusive products and aren't even available to purchase in Danielle's store. This is what makes this box extra special. Knowing that the items are all crafted especially for this box! It honestly felt like Christmas had come early for me - as a massive Sarah J Maas fan, I just knew I wanted this box no mater what it contained. It's hard to pick out a favourite item but Chaol's ring feels pretty damn special! Unfortunately November's box is no longer available to purchase however December's box is and it's Christmas at Hogwarts - Harry Potter themed! And it's only £16.50! So you've had an exclusive look at some of the amazing products that Danielle has to offer and not only that, we're going to give you a hint at for January's Bookish box! Hint: It'll be a royal selection. Enter by completing the rafflecopter form below. A winner will be announced on 4th December! Good Luck! The Review: I’m always on the lookout for festive reads and while I’ve read a few I wouldn’t say any of them have left a great impression on me so far. However, if you are looking for the perfect festive read then What Light is definitely the book I would recommend you read this Christmas. The story follows Sierra and her family who run a Christmas tree farm in Oregon. However every Christmas they have to move all the Christmas tree’s to California where their lot is set up for the Christmas season. So every year they pack all their stuff up and try to sell as many tress as possible before going back home. Sierra tries to never get attached to anyone in California because what would be the point – she’ll be going back home to Oregon in a few weeks. But when she meets Caleb – the boy with a troubled past – Sierra can’t help but want to break her rule of getting close to someone in California. This was the first book I’d read by author Jay Asher and honestly, once I started it was so hard to put it down that I actually read it in two sittings. It’s just the type of story you can cuddle up with on a winter day with a cup of hot chocolate and mini marshmallows and just get lost in the character’s world. Sierra is a lovely character. She’s very sweet and always tries to be honest with people. She’s a very reliable character and doesn’t sway from what she believes in even if that means getting in trouble with her parents. But ultimately she tries to follow her heart and do what is right for her. Now Caleb is such a swoon-worthy character however he does come with baggage that unfortunately effects the way people treat him or see him. But deep down he tries to give the less fortunate families something to look forward to at Christmas and that’s by buying them Christmas trees. I thought this was such a lovely idea and very thoughtful even if some people didn’t appreciate it at times. I guess you can call Caleb a little misunderstood. What I love was how Sierra didn’t listen to idle gossip – she took Caleb at face value and trusted her own feelings. And the results of that were pretty amazing. And I also loved that the book ended with good feelings – even though it was a little open – it still left me believing these two characters got the same happy ending. 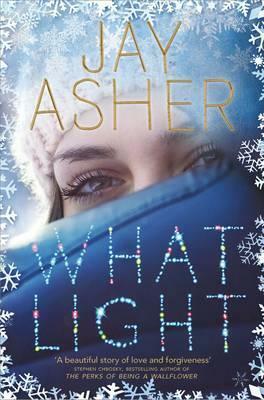 In all, What Light is definitely this year’s Christmas book to read! Go buy it! Thank you to My Kinda Book for giving me the opportunity to review this book in exchange for an honest review.